September's focus is on embracing change and growth and how to make the most out of our circumstances. The first in a series entitled, "Letters to My Son", this video explores the journey of coping with grief and change. 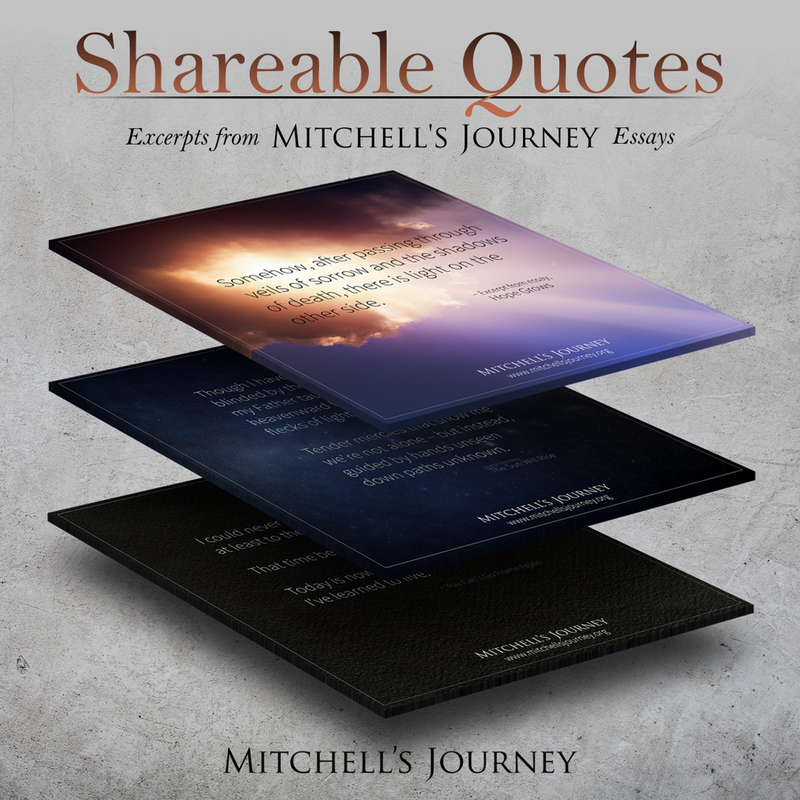 Excerpts from Mitchell's Journey essays you can share on social media. If you have a quote you love, let us know! A thought-provoking exercise to help you assess at what cost you are pursuing some of your life goals. This month our essays will focus on the theme of embracing change and the origins of growth. Pointing to stories of Mitch and other observations, we'll explore ways to get the most out of our circumstances and see silver linings. I Search For Words, Yet There Are None [posted] - Mitch gazed out the window and began to contemplate the end of his life. A look at seeing then hand of God in our lives, despite the suffering we must endure. Pencils & Erasers [posted] - A short story about learning and trying again. I Don't Know How to Help, But I Know How To Be A Friend [posted] - A story about the healing power of friendship during difficult times. A Backpack Filled to Overflowing [posted] - Like our children that collect and carry little treasures, we can collect treasured experiences that will carry with us in this life and beyond. What Children Remember [posted] - When stumbling into a drawing from little Mitch, we learned a poignant truth about how our kids see hardship. Traveling Well [posted] - In honor of Mitch and in hope of others on September 7th, Duchenne Awareness Day, a re-share of a poignant video illustrating the impact DMD has on families. 20 Years [posted] - Reflections on little Mitch and 20 years of marriage. A Special September Event, Come Join Us! Over the years, many readers have asked how they can help support Mitchell's Journey continue its mission and messages of hope. Here is one such opportunity, especially for those who live in Utah. On September 16th, 2017, The Lights Fest will take place in Salt Lake City. Thousands of people will join together to enjoy live music, experience the best food trucks of Utah and light up the sky with sky lanterns as they take flight into the evening sky. You can light your own lanterns in memory of someone you lost or in hope of someone still living. I have a feeling this will be a spirit-felt event. You'll save $5 & $3 dollars will be donated to the Mitchell's Journey Foundation. Personally, I've always wanted to do something like this and I'm thrilled to have an opportunity. I know Mitch would have loved to see such a sight, too. The Lights Fest will donate $3 of your registration fee to the Mitchell's Journey Foundation, a registered non-profit. With your support, we can continue to serve people all across the world. If you register and plan on attending, we would love to meet you at the event. We'll share details on how to find us as we get closer to that date.